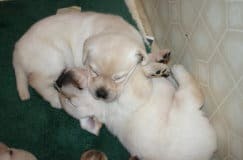 So you’re shopping for a new puppy, and you’re scouring over countless websites of breeders listing the various health clearances that they test for in their dogs… and you see a flurry of letters and abbreviations, including PRA. 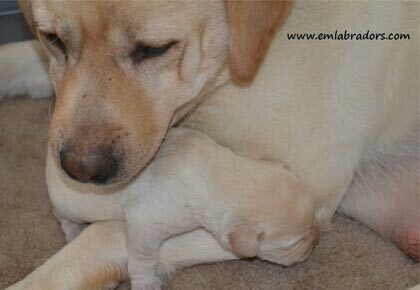 What is PRA in Labradors? PRA stands for Progressive Retinal Atrophy. 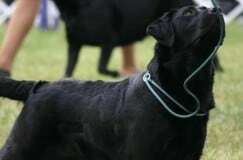 This is a disease that is unfortunately common in Labradors that affects the dog’s sight. A dog with PRA will eventually go blind, and sadly there is no cure for it. It targets the retina of the eye, which deciphers images, and as it says in the name, the disease progressively leads to total blindness. Most dogs are diagnosed around 5 or 6 years of age and at that time are typically already “night blind” and cannot see well in the dark. 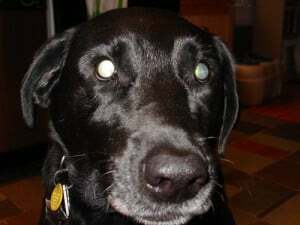 When a dog has PRA, you will see a back lighting, or shine, behind the retina (as seen in the picture above). This can sometimes be confused with the appearance of cataracts as they also trigger a dog’s sight and often causes cloudiness over the retina. Because dogs have such a heightened sense of smell and hearing, it may be a while before you notice any symptoms and by that time the “night blindness” has already set in. Your dog may be apprehensive about stairs or dimly lit areas. PRA is typically diagnosed with genetic testing. 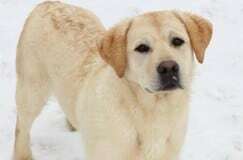 Unfortunately there is no cure for PRA, and some dogs lose total sight within a year of diagnosis. The best thing you can do for them is to focus on enhancing their other senses, and making it easier for them to get around. Keep your home clean and free of clutter, but try not to rearrange all of your furniture, as your labby already has the house mapped out in his mind. Keep it well lit so it is easier for him to see while he still has some vision. And when you’re out on walks, you are now the one to guide him, so be mindful of that and cautious on busy streets. 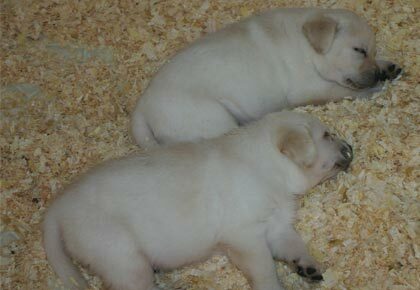 PRA is genetic, and will only occur in a dog that carries both recessive forms of the gene. 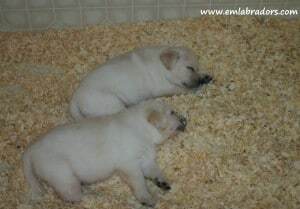 This is why in responsible breeding, we are testing dogs before being bred to prevent breeding two carriers. This test is most often done through Optigen, and merely requires a blood sample to be sent and tested. There are three possible outcomes with this test: The dog will either be affected by the disease (carrying both recessive genes), unaffected but a carrier with one recessive gene, or clear without either recessive gene. 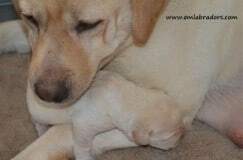 If one of your pup’s parents are a carrier, there is no need to worry as long as the other parent is clear. There will ONLY be affected pups if both parents are carrier. 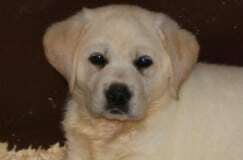 The bright side of this means that in an ideal world, if all breeders were careful to clear for this disease, we could eventually no longer see any affected pups. How great that would be! This is why we stand behind health clearances and responsible breeders, to rule out these diseases carried on through genetics. 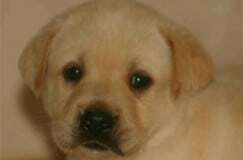 Are All Labradors Plagued With Allergies?? ?